LBB, Hyderabad has just turned a year old and we cannot thank all our readers enough. So, here is a fun list of our favourite things to do in Hyderabad. From watching movies to brunching on momos, this list has it all. Let’s do this together, shall we? Skip visiting Golconda Fort in the day to check out the Sound & Light Show in the evenings. This is held on a regular basis at the fort for a dazzling crash-course into the history of Golconda, narrated by the inimitable Amitabh Bachchan. Transporting you into another world, this show is magical and a must-do. Telangana Tourism handles these shows, and you can check out the next show (and book your ticket). Vasudev Singh, an ex-Googler, and founder of The Himalayan Cafe hosts Sunday brunch at his house and it’s open for a limited number of momo lovers. The in-house Nepalese chef with 16 years of experience whips authentic thukpa and momos, and this is something that you must sign up for. Bringing in the most interesting conversations and love for food and travel, this brunch will cost you INR 450 (veg) and INR 550 (non-veg). 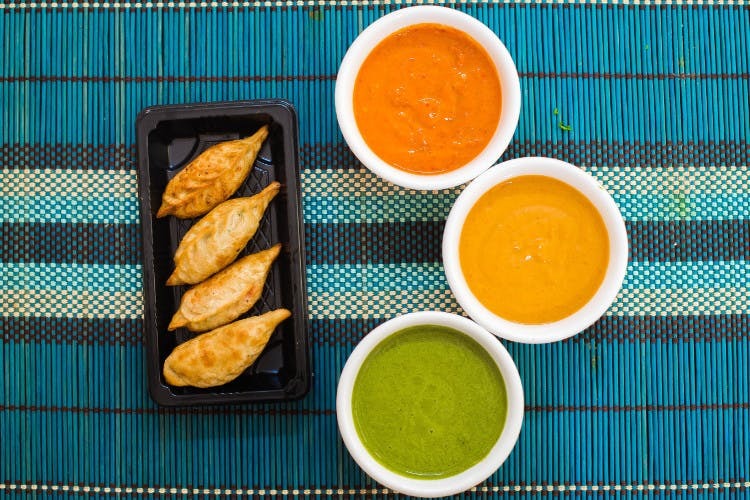 Have four varieties of unlimited momos, thukpa, and thank us later. Do note that you’ll have to reach out to the cafe in advance (via call or Facebook) to reserve a table. Located at RTC X Roads, Sandhya 70mm is where even celebrities watch their movies on the first day of the release. It is often said that the stars come here to experience the reaction of the crowd, first-hand and that the success of a movie can be easily decided by these reactions alone. If you want to experience the real madness of watching a Telugu cinema, you’ve got to watch it on the first day of release in Sandhya. While securing the tickets for a new release in the first week might be tough, we think it’s worth the effort, though. We’re sure you’ve heard about the Sunday Book Bazar but did you check out the underground bookshops in Koti yet? Located in the underground subway near Andhra Bank, these bookstores are a haven for secondhand buyers. But don’t expect a great deal of fiction or good novels as it’s filled with educational and course books that you can grab at cheap prices. But, if you are in and around the area, be sure to check it out as it is something unique. Plus, you can take amazing pictures if you’re phone can do wonders in low light. Surrounded by lofty hills on either side of the river, Papikondalu is a popular getaway for thrill seekers and families. If you’re looking for a quick weekend getaway, not too far from Hyderabad, we recommend this because it comes with activities like night camping, stargazing, exploring the ebbs and flows of Godavari. The boat (or launch) ride begins in Rajahmundry taking you through Pattiseema, Polavaram Project which are located quaintly between hills. While dashing through these hills, you’ll witness beautiful sunsets but it’s the night stay at Kolluru Island that will blow your mind. The stay at this island is arranged in quaint bamboo huts with a view of the river on one side and the forest on the other. Did you know that Hyderabad has an epic underground music scene? And if you think you know your music, you absolutely cannot miss out on these concerts. When our good friend, Aishan Vali, recommended these underground gig scenes by bands that perform all original music across various genres like Rock, Hip Hop, Electronica, Blues, we got psyched! Peeps, it might be tough to score a goal when you’re tumbling down with your homies down the soap, but hey, all is fair in Soap Football. Located in Kavuri Hills, this giant football arena is attracting football enthusiasts, beginners etc. but if you haven’t gotten your hand (slimely) at it, now is the time. Picture a large blue (inflatable) turf with plenty of soapy water; while scoring a goal is what you got to aim, good luck doing that while slipping. Plus, they have happy hours from 10am-4pm too where you and your squad can score goals and an hour of turf at a cheaper price. One of Hyderabad’s best-kept secrets, Mahabodhi Buddha Vihara is a Buddhist temple and monastery where you can go to meditate for hours together. The temple is at a height, but at the entrance is the wheel of dhamma or dharmachakra and plenty of open space, if you don’t go all the way up. The architecture is simple, but spectacular for it has the Buddha seated under the Bodhi tree with deer and dhammachakras carved. The sound of birds chirping and the rustling leaves will make you feel like you are teleported to Dharamshala. So what if you cannot take your next trip to Mcleodganj? You can check this one out, right in the city.